Who are the Cheeses in Your Refrigerator? I’ve got about 13 different cheeses in my fridge right now! This blog is allowing me to have the excuse to pick up any cheese that’s vaguely appealing in the interest of “kitchen science” so I thought it’s high time that I sampled a few and shared my thoughts about them here. After careful consideration, I narrowed my tasting selection down to the following five that appear on this plate. Starting at the top, in a sort of clockwise swirl, they are Red Leicester with Chilli & Red Bell Pepper, Beecher’s Marco Polo, Dubliner with Irish Stout, Irish Porter Cheddar, and in the middle, Cabot’s Alpine Cheddar. OK, now let me tell you what I thought about them all. I’ll start in the middle with the one from Cabot, as it’s a sort of permanent dweller in my fridge. I’ve long been a fan of Cabot cheeses and years ago, I even visited their factory up in Vermont! More recently, a local grocery store has been carrying this special Farmers’ Legacy Collection. Since I lived in the (Italian) Alps for a spell and fell head over heels for that charming culture, I’ll admit I’m a sucker for anything that references it. The Alpine Cheddar label calls it nutty and smooth with hints of Swiss & Parmesan. I’ve previously confessed my love for Parmagiano, so this one was is an easy favorite for me. I eat it all the time; it is my go-to, standard, must-have-on-hand cheese. And, it recently went on an insane sale at less than a $1 per bar, so I snatched up several of them to keep me going for the next few months. To the right of the Cabot Cheddar is Marco Polo made by Beecher’s Cheese of Seattle. I picked this one up a few weeks ago at the local health food store. I had actually not heard of Beecher’s before, but it seems that they’ve got an East Coast outpost in NYC’s Flatiron district so perhaps there will be a field trip in the future? Below the pepper-studded Beecher’s lies a pile of soft crumbles that was chipped off the small wheel of Dubliner blended with Irish stout. Dubliner is the cheese you always see on prominent display in the cheese departments of North American grocery stores around St. Patrick’s Day, but it’s available year-round. I spied this green wax–minor evidence of which appears on the rim of the plate–wrapped treat at two nearby grocery shops and curiosity eventually won me over. The flavor begins in a subtle fashion but then pretty quickly, the alcoholic enhancement makes itself known. 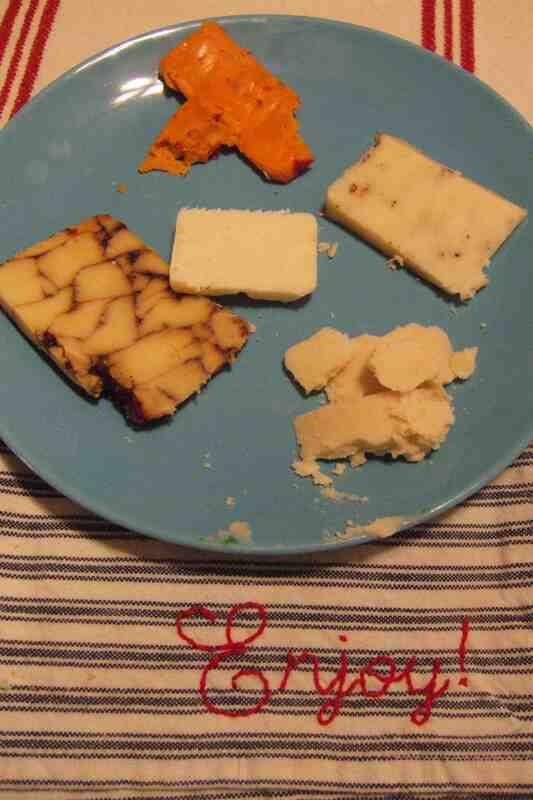 I was reminded of some of the Scottish cheddars I’ve tried imbued with whisky. Stout is considered by some (including me) to be a sort of meal in a glass, so imagine that mixed with cheese and you’ll understand why I didn’t feel the least bit hungry after just these few bites! Crossing to the west side of the plate, but remaining in Ireland, let me tell you about this funky-looking cheese that I picked up at Trader Joe’s. I’m not exactly sure how it’s made but I imagine that while these chunks of cheddar are aging, peaty porter beer is poured over them and it sort of fills in all the nooks and crannies. I first tried this cheese, though not this exact variety, on a cheese plate in Dublin. I loved it then and it’s not that common, so I eagerly snap it up whenever I stumble across it. The flavor here is more subtle than the previouly reviewed stouty cheese and that’s no surprise if you compare a pint of porter and one of stout, though the two are closely related. Finally, I’ve saved the boldest, sassiest cheese for last. Another TJ’s find, this English Red Leicester (pronounced “lester”) is bright orange with little red flecks from the chillis (FYI, the Brits spell this word like so) and red bell pepper. Those two ingredients insure that this cheese packs a spicy punch. In some ways, it reminded me of my beloved pimiento cheese (which you can read about in my first post) but without the mayo to soften it, its flavor is all the more ka-pow! Next time, I’ll definitely sample this one on a cracker, so some of its intensity can be absorbed. I might also try making a grilled cheese with it and see how it compares to one made with ‘menta cheese. Well, that about covers all the super special cheeses in my fridge at the moment. If you’re curious about the other eight, they are: fresh mozzarella, Parmagiano Reggiano, Pecorino Romano, Baby Bel Gouda & Sharp Cheddar, a Swiss & Gruyere grated blend, whipped cream cheese, and cottage cheese. See, I wasn’t kidding when I said I had 13 varieties on hand. And I’m sure I will have found some more to try before long, so check back soon, and in the meantime, enjoy the discoveries of the other turophiles on this blog. I’m currently visiting my in-laws in Northern Norway, where the nearest grocery store is 8 km away and a specialized cheese shop isn’t in high demand. So, I was a little uncertain what cheese I could share with you this week until I saw my mother-in-law reach into the cheese case during our Easter grocery-shopping trip yesterday. She grabbed a small, black-wrapped crescent moon of cheese called Gamalost (“old cheese”) – it’s a semi-soft blue cheese made from skimmed cow’s milk. I’m not sure if this cheese was called “old cheese” when it was first produced – the name now hints at its lack of popularity and production. Gamalost was once a staple of the Norwegian diet mostly because it could (and can) be stored for a long time without refrigeration. 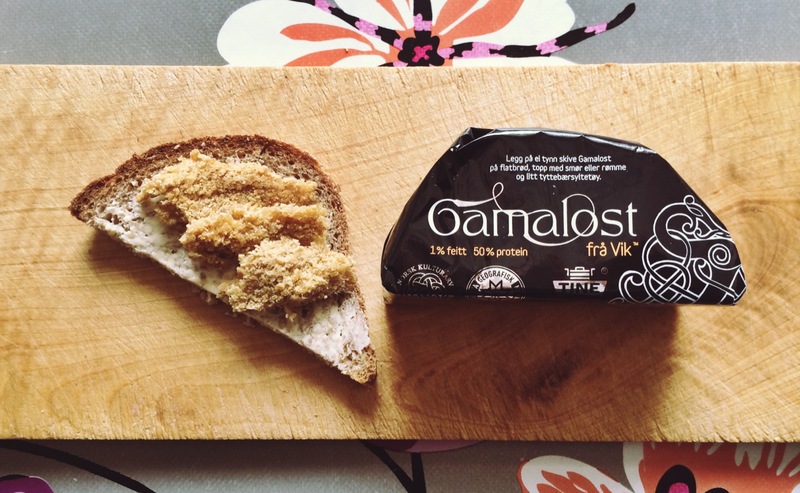 Making gamalost is quite laborious, so it is no longer made in large quantities and is rare to find outside of Norway. It is only made in the town of Vik in Southwestern Norway. The first look at this cheese was a little off-putting because of the texture. 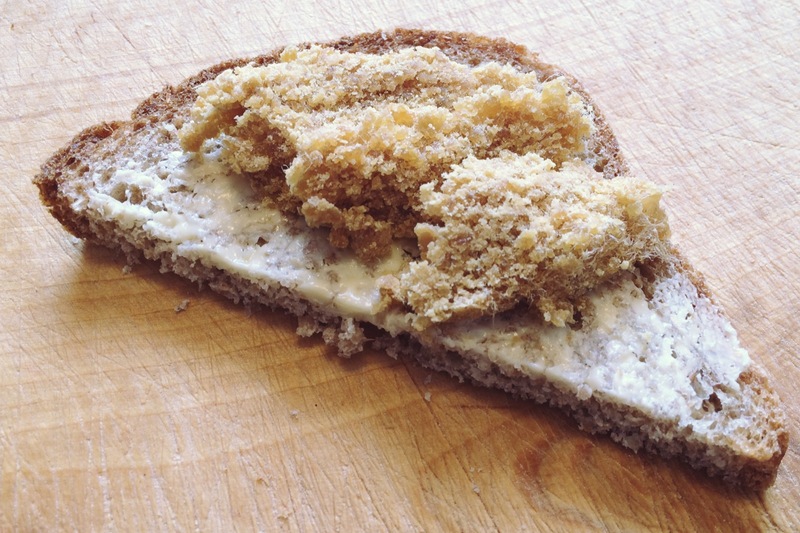 It’s grainy and almost looks like it has been rubbed in bread crumbs. The taste is not bad though – the moldiness really shines through in a good way and I could imagine going back for more of this when I want something a little different from my usual blue cheese. I should also mention that Gamalost really packs a protein punch with a low-fat content. I’m so happy to add one more Norwegian cheese notch to my belt. I encourage you to do the same should you ever find yourself on these shores. Just don’t let the weird texture discourage you from trying it!